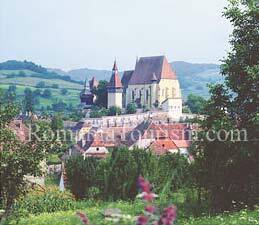 Romania's collection of castles and fortresses perhaps best illustrates the rich medieval heritage of the country. While castles built from the 14th to the 18th centuries are strong and austere fortresses built mainly for defense against invaders, those erected beginning in the late 1800s are imposing and luxurious. 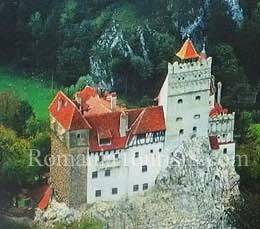 The most popular include the 14th century Corvin Castle, built on the site of a former Roman camp, the elegant 19th century Peles Castle with its 160 rooms filled with priceless European art and, of course, the Bran Castle, built in the mid-1300s and legendary home to Bram Stoker's Count Dracula. Universal literature found valuable sources of inspiration in some of Romania's castles, with the most famous novels written about them being "The Castle in the Carpathians" by Jules Verne and "Dracula" by Bram Stoker. Featuring late-gothic architecture with heavy doors and double exterior walls, the church boasts the largest Transylvanian multi-paneled wooden altar and a remarkable wooden door which once protected the treasures in the sacristy. 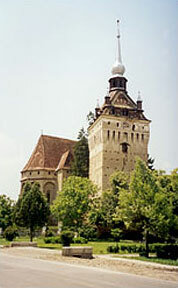 From 1572 to 1867, Biertan was the seat of the Saxon Evangelical bishops of Transylvania; their fine gravestones can be seen inside the Bishops' Tower. Surrounded by an aura of mystery and legend and perched high atop a 200-foot-high rock, Bran Castle owes its fame to its imposing towers and turrets as well as to the myth created around Bram Stocker's Dracula. Narrow winding stairways lead through some 60 timbered rooms, many connected by underground passages, which house collections of furniture, weapons and armor dating from the 14th to the 19th centuries. Built in the 13th century by Count Chyl de Kelling, the Fortified Church at Calnic (German: Kelling) is one of the most imposing defensive structures in Transylvania. 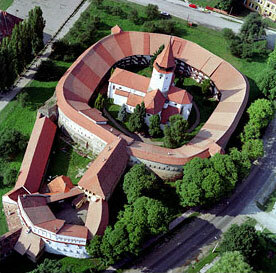 First documented in 1269, the fortress served as a residence for Saxon nobility until 1430, when it was sold to the peasant community of Calnic. Enclosed by one and a half rings of high walls fortified with a defensive tower to the south and a gate tower to the north, the fortress withstood several Ottoman sieges. The five-story-high Siegfried Tower, the landmark of the fortress, is endowed with defensive corridors and firing windows. An on-site medieval art museum displays various artifacts. The Bethlen Castle was built in the 16th century in the French Renaissance style and restored in the 17th and 18th centuries when Baroque elements were added. 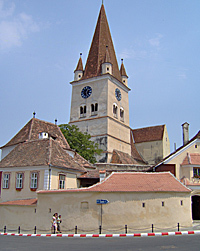 The Reformed Church, situated next to the Castle, is a 13th century structure. The Jidvei (Bethlen-Haller) castle, with its eclectic combination of architectural styles, is located on the outskirts of Cetatea de Balta and it ofers its guests with quaint views of the village. Jidvei, one of Romania's premier white wines wineries is a five-minute drive from Cetatea de Balta. 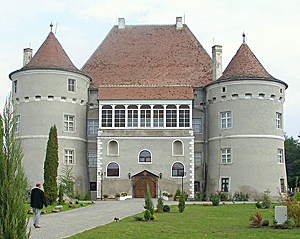 The Jidei (Bethlen-Haller) castle can host business meetings, conferences, private dinners or wedding receptions. Various exquisite local wines and original menus, that include traditional dishes prepared by local chefs, will, most likely, please even the most discerning palates. Originally built in the 12th century as a Romanesque basilica, the church was fortified during the 15th century to protect the local Saxon population against repeated Ottoman raids. The fortification process included the construction of fortified towers over the two side entrances and the choir, the building of a double structure of defense walls, a moat and several defensive towers along the walls. The clock installed in the 195-feet high (bell and clock) tower has been working since 1868; no repairs were ever needed ! 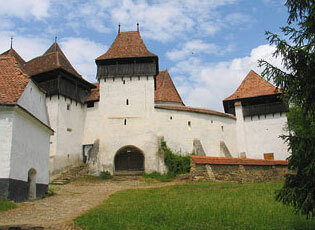 The greatest Gothic-style castle in Romania, Corvin was built by the Anjoufamily on the site of a former Roman camp. 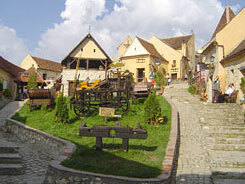 The castle served as a fortress until the mid-14th century when it became the residence of Transylvania's ruler, Iancu de Hunedoara. 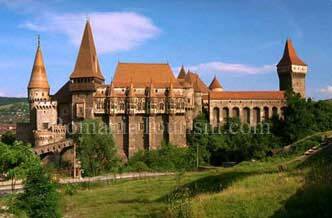 Iancu upgraded the fortress transforming it into the most stunning castle in Transylvania. The beautifully preserved structure features a sumptuous Knights' Hall, an impressive drawbridge, high buttresses, inner courtyards, a chapel and some 50 rooms resplendent with medieval art. 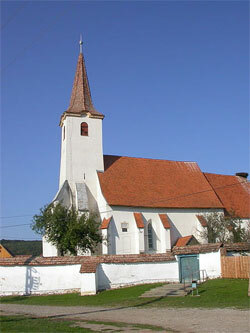 The gothic-style Evangelical Church (1495) in the village of Cristian stands on the site of a 13th century Roman basilica. 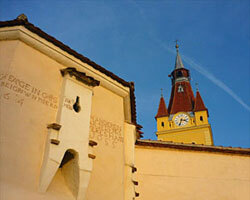 Built in the 16th century, the church is enclosed by two rows of walls guarded by towers. Two underground tunnels allowed villagers to flee from the fortress to the forest or to an old monastery in times of siege. The fortified church at Darjiu was initially built in Roman style in the 14th century, and later rebuilt in gothic style. It was fortified in the 16th century when locals drew inspiration from the fortified churches of neighboring Saxon villages. The Gate Tower preserves its initial form, with openings for shooting missiles; wooden shutters provided protection against incoming projectiles. The original interior frescoes, some of the most impressive Transylvanian medieval works, have been preserved. 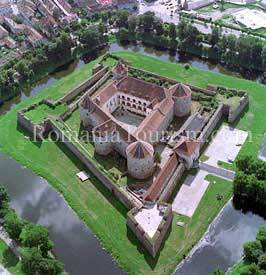 The beautifully preserved fortress houses the Fagaras County Museum, displaying Roman artifacts, a collection of medieval weapons and traditional folk crafts. 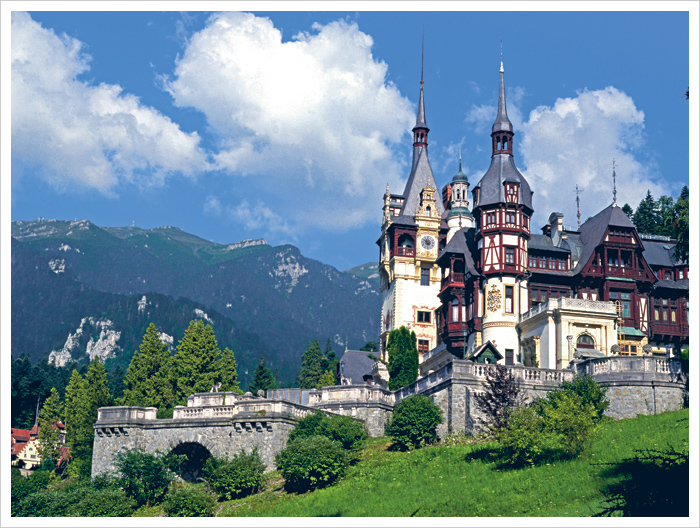 Also worth exploring in town is Sinaia Monastery, founded by Prince Mihai Cantacuzino in 1695, and named after the great Sinai Monastery on Mount Sinai. The monastery served as the residence of the royal family until Peles Castle was built, and now is home to a monastic establishment. 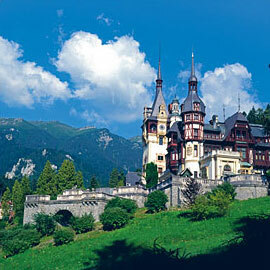 Peles Castle was the first European castle entirely lit by electrical current. The electricity was produced by the castle's own plant. The castle draws its name from neighboring Peles Creek, which passes right through the courtyard. The first movie projection in Romania took place in 1906 in the castle's Theater Room. Vlad Tepes ( Vlad the Impaler) recognized the potential of the location and upon taking over the throne, he ordered that the structure be repaired and consolidated, turning it into one of his main fortresses. When the Turks attacked and captured the castle in 1462, Vlad escaped via a secret passageway leading north through the mountains. Although the castle was used for many years after Vlad's death in 1476, it was eventually abandoned again in the first half of the 16th century and left to the ravages of time and weather. In 1888, a major landslide brought down a portion of the castle which crashed into the river far below. The castle underwent repairs and the remnants of its walls and towers stand to this day. (Tartlau in German) was built by Teutonic knights in 1212-1213. The powerful surrounding walls are 40 feet high and 10-15 feet thick. Historical records attest that in its 500 years of existence, the fortress was besieged 50 times. However, it was only captured once, in 1611 by Gabriel Báthori, Prince of Transylvania; the fighters defending the fortress have surrendered after not having no drinking water available for several days. Access to the building was through a 100-foot-long arched passage fortified with two rows of gates. Each village family had a designated room for shelter in case of attack. The red-roofed wall accommodated 272 rooms, stacked over four stories and linked by wooden staircases. Rasnov Fortress (Rosenau in German), is located on a rocky hilltop in the Carpathian Mountains, 650 ft. above the town of Rasnov. First mentioned in an official document in 1331, the fortress was built by Teutonic Knights as protection against invading Tartars and was later enlarged by the local Saxon population. Strategically located on the commercial route linking the provinces of Transylvania and Walachia, Rasnov differs from other Saxon fortresses in that it was designed as a place of refuge over extended periods of time. Recently, the old fortress has been restored to its former glory and today, you can visit the impressive remains. There is also a museum here, hidden behind the ancient walls, where you can find a skeleton buried beneath a glass floor, as well as some other interesting artifacts. 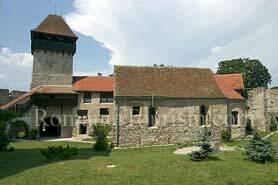 Located in the Vineyards Valley, this fortified church was built in 1263 in gothic style and was enlarged and fortified in the 15th and 16th centuries by adding a range of 26-foot-tall and five-foot- wide walls. A unique element is the well in the center of the church choir that provided water for the locals during sieges. Inside, you can admire Saxon furniture and decorations dating from the 16th century. 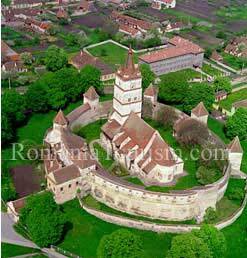 One of the most interesting Saxon fortified churches is located in the village of Viscri (Weisskirch in German). The name comes from the German Weisse Khirche, meaning white church.